Here is another recipe of khajur. Dates or khajur is a rich source of fibre, protein and vitamins. I love to take khajur daily in my diet because of its health benefits. We can make a variety of desserts with this fruit like khajur halwa, khajur milkshake and the khajur laddus. After the milkshake I’m sharing another Khajur recipe with you. I consider cuisines made from the dates healthy as there is no need to add sugar unlike other desserts. I’d made these laddus with homemade mawa or khoya (a dairy product), desiccated coconut and dry fruits. 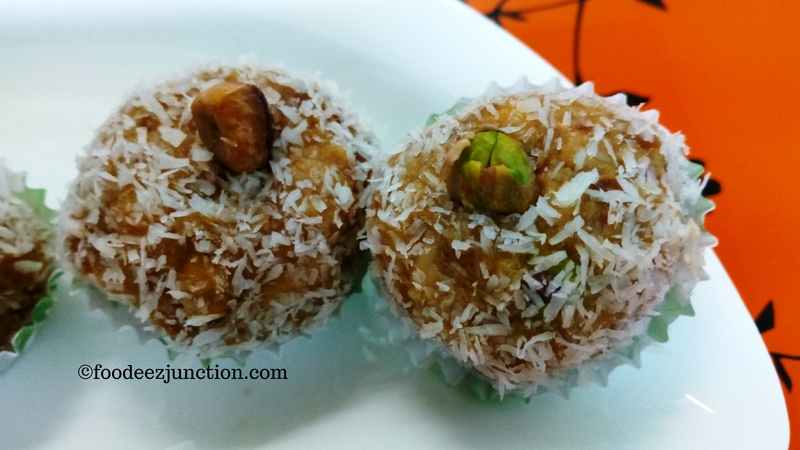 Since Ramadan is here, you can make these Khajur Laddus at home in Iftari. 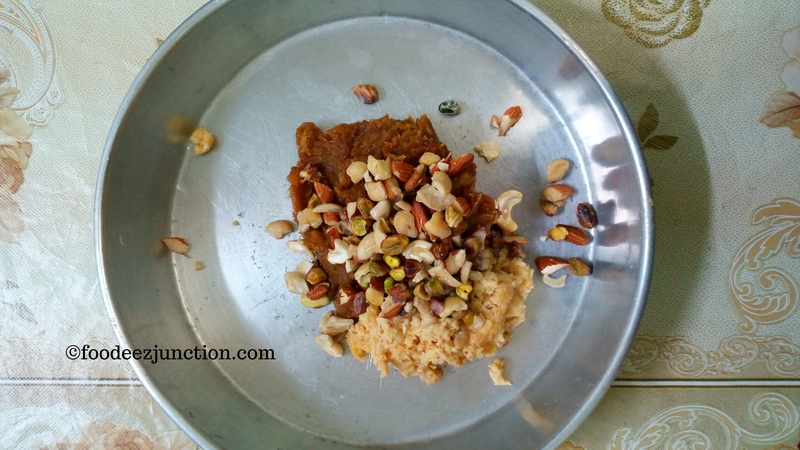 My advise, use home-made mawa, it makes the dessert more tasty. To make the Khajur Laddu, you need to first grind the dates coarsely, and then mix the rest of the ingredients to make small, round-shaped balls. It is then rolled in the desiccated coconut. Let’s make it, now. Dry fruits and desiccated coconut measurement depends on how much you want to add. I would suggest you to first make with the above-mentioned ingredients and then experiment on increasing the dry fruits’ measurements. De-seed and wash the dates. Drain. Transfer in the blender jar. Add two tbsp of milk. Now blend coarsely. Open the blender jar and check if the dates is blended coarsely. If not, then add some more milk and blend again. The coarse paste of Khajur should be as shown in the pic below. Now, take a kadhai or wok, add pure ghee, heat for 10 seconds and transfer all the Khajur paste. 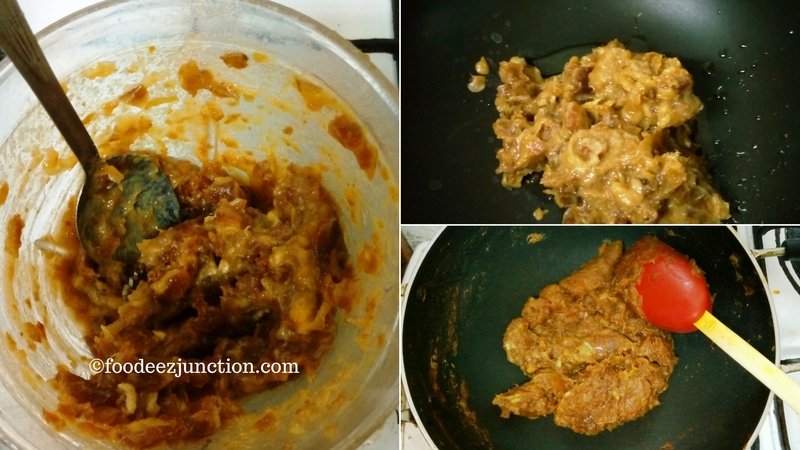 Mix well and roast for five minutes or till the paste of khajur becomes little bit dry. Leave it to cool. 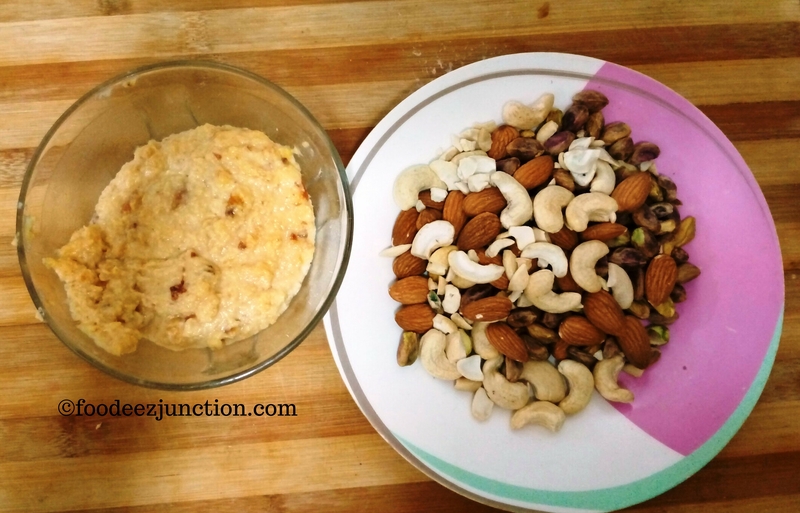 By the time chop all the dry fruits – cashews, almonds and pistachios. Transfer all the ingredients – roasted khajur, mawa, four tbsp desiccated coconut and all chopped dry fruits in a salver (thali) or platter. Mix well with your hands. Make round balls. In a separate bowl or dish pour put the rest of the desiccated coconut. Take the round balls of khajur and roll over the coconut. Keep aside and insert one pistachio each on the Khajur Laddus, one by one. Serve in a dish or serving tray. Enjoy this healthy, yummilicious khajurs laddus! Do not add much milk otherwise it can become fine paste, thus, making it difficult for you while making laddus. While making the khajur ka laddu, if it sticks in your palm, apply a drop of pure ghee and then make. Make the small-size laddus as it is sweet in nature. You can make extra Khajur ka Laadus and store in an air-tight container for 10-15 days. But before you store them, keep them in the refrigerator tray for two hours and then transfer to the air-tight container.